Powers/Abilities: The Monster-Master wore a suit of armor and used a sword. He designed and controlled Zoga, a giant dragon creature. (Iron Man I#30 (fb) - BTS) - Toru sought to takeover Japan and purge it of Yankee invaders. He became so fanatical in this desire that he allied himself with Communist Chinese, who financed his development of Zoga. Toru adopted the costumed identity of the Monster-Master. The energies utilized in creating Zoga were detected by Toru's research superior, Goro Watanabe. Feigning ignorance, Toru helped Goro in establishing Project: Delta, apparently to investigate these energies. (Iron Man I#30) - Toru, Fujiko, and Goro were present in the laboratory of Fujiyama Industries, where Iron Man demonstrated the power of his tractor beams and energy rays. Toru suggested that Iron Man might help with Project: Delta. Iron Man proved agreeable and accompanied them on a trip to the island. As they investigated, Toru got ahead of everyone else and then suddenly vanished, after which Zoga confronted and attacked the others. Zoga incapacitated Iron Man and drove off the Japanese who accompanied them, though they did take Iron Man with them. The Monster-Master then guided Zoga back to the Chinese Communists. Toru later returned to Goro and Fujiko, claiming to have been knocked out during Zoga's attack, but to have escaped. Later, Zoga appeared over Japan, assaulting an oil refinery and easily shrugging off assaults by anti-aircraft cannons. 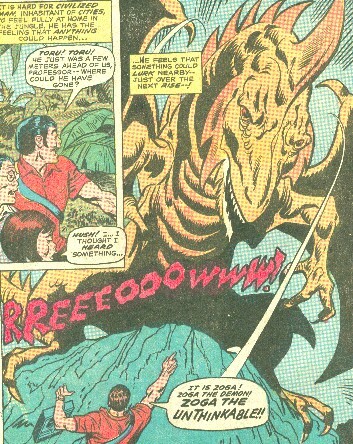 Iron Man flew after Zoga, but it escaped his detection. Zoga was later attacked by the Japanese Air Force, and Iron Man followed the fight to confront Zoga again, and was again knocked from the sky. However, Iron Man recovered and continued the assault, while Goro readied a weapon that Iron Man had instructed him to bring. Iron Man dodged Goro's next energy blast, which struck Goro's parabolic mirror and was reflected back on Zoga's eye, causing Zoga to overheat and crash to the ground. 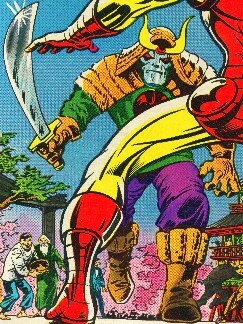 Iron Man pulled the Monster-Master from Zoga's head and unmasked him as Toru, who shouted out his mission before dying. Comments: Created by Allyn Brodsky, Don Heck, and Chic Stone. Is Allyn Brodsky Sol's wife? Good plot. Toru suggested that they bring Iron Man in to assist in Project: Delta, the investigation of his activities as the Monster-Master. And, of course, Iron Man foiled his plot. I'm not really certain what Project Delta was. Initially it seemed to be the investigation of the Monster-Master and his creations. However, the Chinese Communists called Zoga Project D, indicating that perhaps Project D was actually the development of Zoga...which would mean that Goro was allied with Toru? Formed by Goro Watanabe and Toru Tarakoto in response to the detection of highly sophisticated electromagnetic emissions coming from a barren island in the Sea of Japan. These emissions were, of course, released from the energies powering Zoga. Daughter and secretary to Goro, she was also the lover of Toru and did not suspect that he was secretly the Monster-Master. However, she also disliked America, and despised the idea of American technology overshadowing that of Japan. A research scientist and father of Fujiko, his equipment detected the energies released by the creation of Zoga, and he formed Project Delta with his assistant, Toru. He apparently did not know that Toru had created Zoga. He worked with Iron Man to defeat Zoga and the Monster-Master. He pleaded in vain to the Japanese Defense Conference about Zoga, and he brought the parabolic mirror at Iron Man's request, which destroyed Zoga. Zoga was apparently 25 to 35' tall, possessed superhuman strength (Class 75-100) and durability. It could fly at great speeds, breath fire, and project laser beams from its eyes. It was piloted from within the dragon's head, and it also had a sophisticated radar blocking unit.